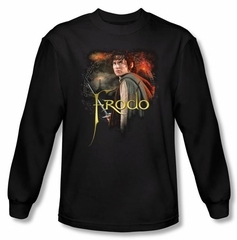 This Lord of the Rings movie book long sleeve t-shirt features a detailed image of a detailed image of Frodo holding his sword against a black background. Frodo Baggins, son of Drogo Baggins, was a Hobbit of the Third Age, and one of the most famous of all Hobbits for his leading role in the Quest of the Ring. The Lord of the Rings is an epic film trilogy consisting of three fantasy adventure films based on the three-volume book. 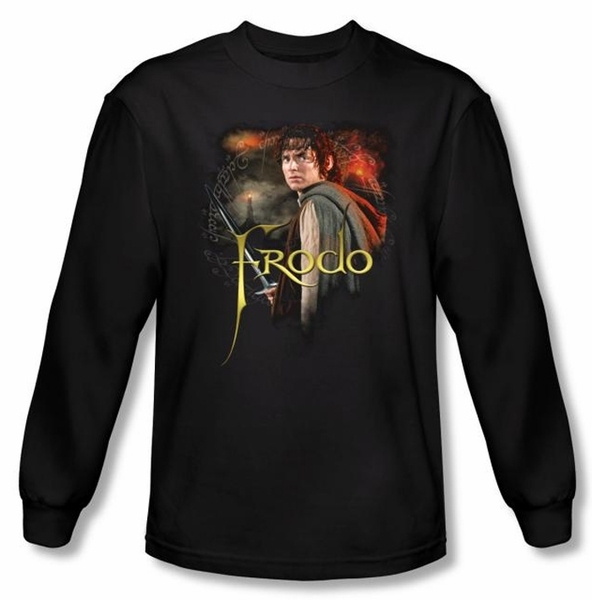 This Exclusive The Lord of the Rings t-shirt is the ultimate shirt for the Lord of the Rings fan! The trilogy was a great financial success, with the films collectively being the sixth highest grossing film series of all time.